Hair loss is the most common hair problem and a prompt diagnosis of the type of alopecia may sometimes be extremely challenging. Methods commonly used to investigate may be invasive (biopsy), semi invasive (trichogram) or non-invasive (hair count, weighing shed hair and pull test). Dermoscopy, also known as epiluminescence microscopy or skin surface microscopy is a non-invasive, in-vivo technique, most commonly used for viewing pigmented skin lesions. It has been proved to be of great value in improving the accuracy of diagnosis of melanomas. In 2006, Lidia Rudnicka and Malgorzata Olszewska coined the term "Trichoscopy" for dermoscopy of hair and the scalp. For scalp examination, a manual dermoscope (×10 magnification) or a videodermoscope with lenses ranging from ×20 to ×1000 magnification can be used. , This article attempts at sensitizing readers to the trichoscopic features associated with the most common scalp and hair disorders. All the images have been taken using Delta 20 (Heine, Germany) and videodermoscope (Derma India). 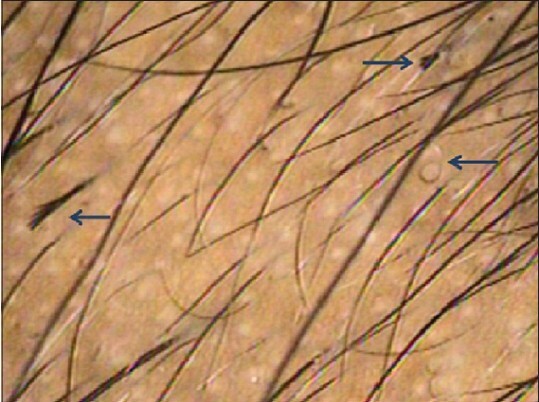 Dermoscopy of normal healthy scalp shows follicular units containing 2-4 terminal hairs and 1 or 2 vellus hairs. In darker races, a prominent brown homogenous honeycomb pigment network is seen over the scalp which is accentuated over sun-exposed areas [Figure 1]. 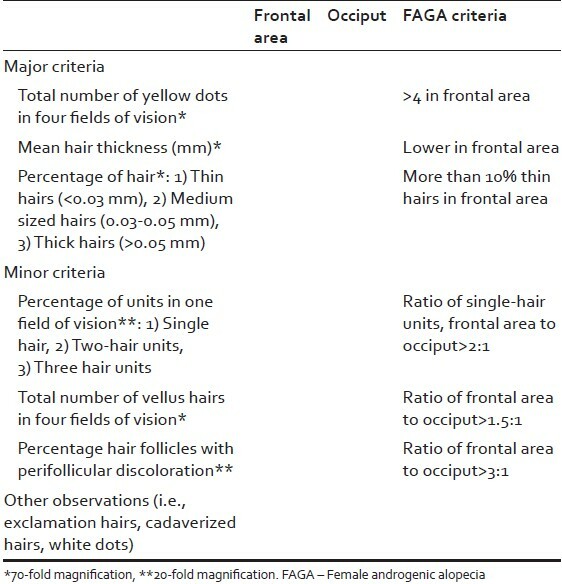 Trichoscopic evaluation of normal and diseased scalp is based on study of follicular patterns, interfollicular patterns and hair signs [Table 1]. Most of the manual dermoscopes are contact dermoscopes, which require an interface solution like oil or alcohol. However, videodermoscopes are non-contact dermoscopes and usually have three modes, the white light, ultraviolet (UV) light and the polarized light (PL). Videodermoscopes in addition, provide for a better consultation as the doctor and patient can view the video graphic images simultaneously and also record the selected images for comparison during the subsequent follow-up. The interfollicular patterns, which relate to vascular structures and pigmentation, are visualized only with a polarizing light source or a polarizing filter. Pigment patterns are best observed through a contact dermoscope with an interface solution whereas vascular patterns are best seen through a videodermoscope, as direct contact can result in blanching. , However, in the darkly pigmented skin, the heavy pigment obfuscates the vascular patterns. 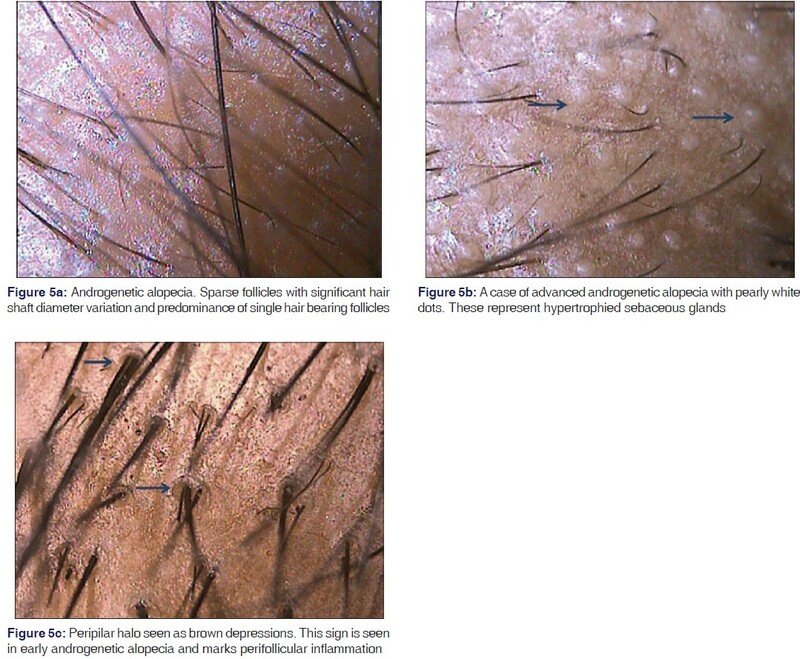 While hair shaft signs are described with individual hair diseases, other patterns are described below. These are seen as yellow colored round or polycyclic dots, best seen under PL and are known to represent follicular infundibulum, distended with degenerating keratinocytes and sebum. , In darker skin shades they may appear pale against the honeycomb pigment background [Figure 2]. Yellow dots are the most common and most sensitive feature of alopecia areata (AA), but are also seen in some cases of androgenetic alopecia (AGA) and alopecia incognita. , Yellow dots in AA are keratinous whereas they represent sebaceous debris in AGA. They are more common in areas with sparse terminal hairs. These appear as pale white dots and are seen in cicatricial alopecias that spare the interfollicular epidermis, like lichen planopilaris (LPP) or folliculitis decalvans. 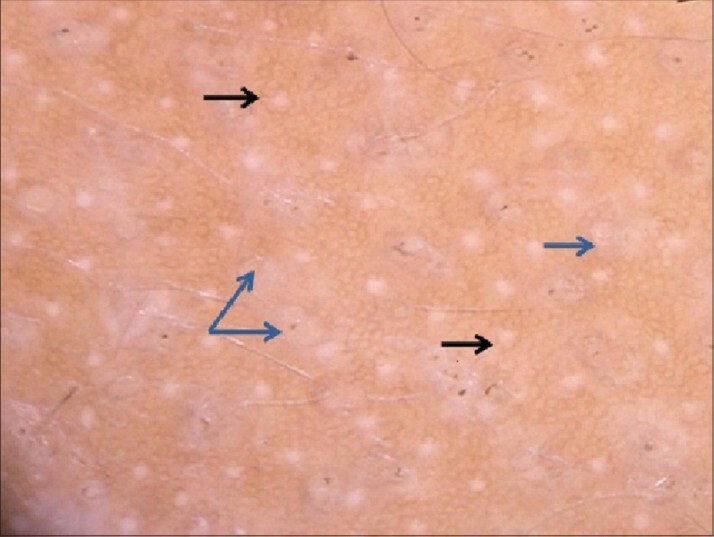 White dots represent the destroyed follicles that are replaced by fibrous tracts and are better visualized in dark skinned individuals or over the tanned areas in light skinned individuals. The honeycomb pattern provides a contrast against which the white dots are visualized [Figure 3]. An easily confused entity are the eccrine duct openings which also appear pale, but can be differentiated as they are well-defined and rounded structures, placed regularly and are seen in normal and diseased scalp. These are seen within the yellow dots and represent stubs of hair (cadaverized hair), that are fractured before emergence from the scalp in AA [Figure 4]a.
Arborizing red lines: , These are seen as lines that underlie the loops in normal and affected scalp. These are best seen at higher magnifications and are believed to represent the sub-papillary plexus. The vascular patterns described are readily visualized in white skinned individuals, but in the pigmented skin types these are overlapped by a more pronounced pigment pattern. A diffuse honeycomb pigment pattern is classically seen in normal scalp and is more pronounced in individuals with darker skin shades. Bald areas and areas with sparse hair, as seen in men with advanced AGA, have a darker pigment network which corresponds to tanning due to excessive sun exposure. This pattern is characterized by grid (irregular lines) and holes. The lines are hyperchromic and represent melanotic rete ridges, whereas the holes are the hypochromic suprapapillary epidermis [Figure 3] and [Figure 4]a. Diagnosis of this most common pattern alopecia affecting both the sexes (up to 80% men and 50% women) is usually clinical, but rarely a biopsy may be required to differentiate it from telogen effluvium, diffuse AA or alopecia incognita. Some characteristic trichoscopic features may simplify the diagnosis in such cases. AGA results from progressive miniaturization of hair follicles and thus the earliest and diagnostic feature is a hair shaft diameter variation of more than 20% hair shafts. ,,,, Proportion of thin, vellus hairs gradually increases in AGA. 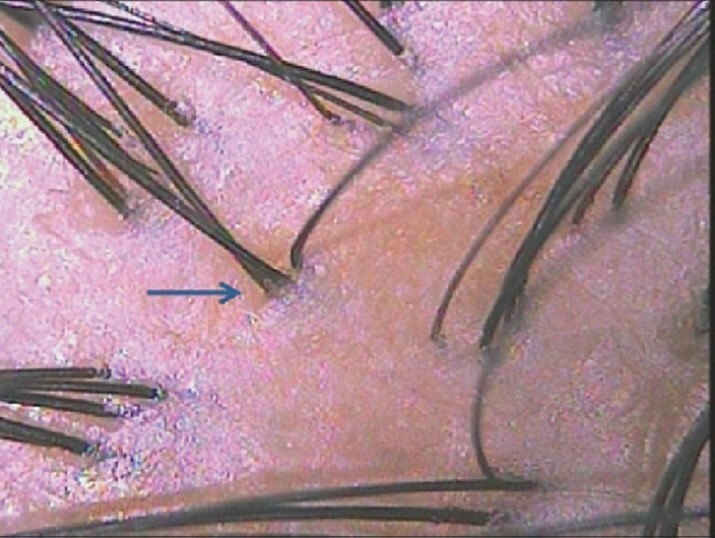 In addition, follicles in AGA show presence of single hair unlike normal unaffected follicles which bear up to 4 terminal hairs ,, [Figure 5]a. These features can be better appreciated by doing a comparative trichoscopy of the spared occipital area. Pearly white dots (papules) which may be seen in long standing cases of AGA, represent hypertrophied sebaceous glands. The sebaceous gland activity is intact even in a miniaturized terminal follicle and in fact the gland may be hypertrophied due to the end organ sensitivity to circulating androgens [Figure 5]b. Advanced cases may show a prominent honeycomb pigment pattern over the bald areas and presence of empty follicles which may appear as raised white dots due to the presence of hypertrophied sebaceous units, a consequence of androgen sensitivity. Several commercially available software help calculate the terminal to vellus hair ratio, monitor hair shaft thickness and grade severity. The trichoscopy findings can vary depending on the stage, site and severity of the disease, though some authors may differ. ,, Black dots, tapering hairs and cadaverized hairs [Figure 4]a and b] are the most specific findings and correlate well with disease activity. Yellow dots as described above are seen in all the stages of the disease and correlate with disease severity. In the author's experience, they are relatively less common in our population as compared to European counterparts (95%). , These yellow dots usually contain fractured dystrophic hair (cadaverized hair, black dots), short vellus or telogen hairs. 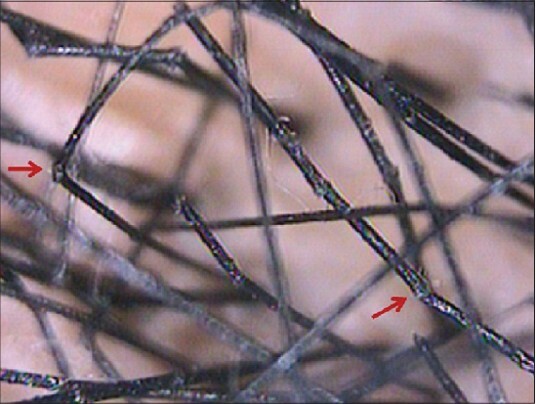 Acute stage is characterized by exclamation hairs and black dots, whereas in long standing cases these dystrophic hairs may be shed and empty follicles may be seen. Sometimes re-growing vellus hairs may be present. Short vellus hairs are a sensitive marker of hair re-growth. These re-growing hairs may be coiled as a pigtail as described by Rudnicka et al. Trichoscopic examination of epilated hair can be done by placing the hair against a light background and visualizing the roots at higher magnification (dermoscopictrichogram). Active disease is characterized by dystrophic hairs with fractured roots and telogen hairs. , Coudability sign represents terminal hair which kinks towards the proximal end when pushed perpendicular to the skin [Figure 4]c. They are important markers of disease activity. The trichoscopy findings described for typical scalp AA may not be seen as well over non-scalp sites. Telogen effluvium is characterized by findings like decreased hair density with presence of empty follicles. It can be easily differentiated from AGA due to absence of hair shaft diameter variation and peripilar halo. It affects the entire scalp unlike AGA. On trichoscopy, telogen effluvium is a diagnosis of exclusion. Tinea capitis is the most common dermatophytic infection of childhood and diagnosis is usually clinical. Culture though considered to be gold standard, has a long waiting period and is cumbersome, delaying therapy. Although trichoscopy can be a useful aid in diagnosis, standard antiseptic precautions should be observed while using the instrument. Alternatively, the procedure can be performed using a separating transparent film (e.g. microwave film). Specific dermoscopy features described here simplify the diagnosis and also serve toward prognosis. The UV light mode in the trichoscope can demonstrate the fluorescence caused by the fungi. Trichotillomania usually affects children and presents with patches of alopecia with irregular and bizarre borders. The spared interfollicular skin shows the honeycomb pigment pattern and some spared follicles bearing terminal hairs. Pulled hairs reveal anagen roots with preserved hair sheaths. DLE of scalp is uncommon and diagnosis is usually clinical as other sites may also be involved. In cases involving only the scalp, dermoscopy helps in differentiating it from other causes of cicatricial alopecias [Figure 9]. Dermoscopy of the affected skin shows atrophy with complete loss of follicular openings. Arborizing telangiectasia are seen over the patch. Prominent hyperkeratotic follicular plugging is seen at the periphery of the plaque. Dark brown to blue-grey pigment pattern is seen in DLE affecting the interfollicular area unlike in LPP where it is concentrated around the follicles. ,,, In addition, LPP spares some intervening follicles and thus can be easily differentiated from DLE. Hyperkeratotic perifollicular scales is a feature observed in both the conditions and signifies inflammatory change. Dissecting cellulitis is characterized by yellow dots, appearing as 3D structures imposed over dystrophic hairs. Advanced cases are difficult to differentiate from other scarring alopecias as they appear as fibrosed patches with absent follicular ostia. 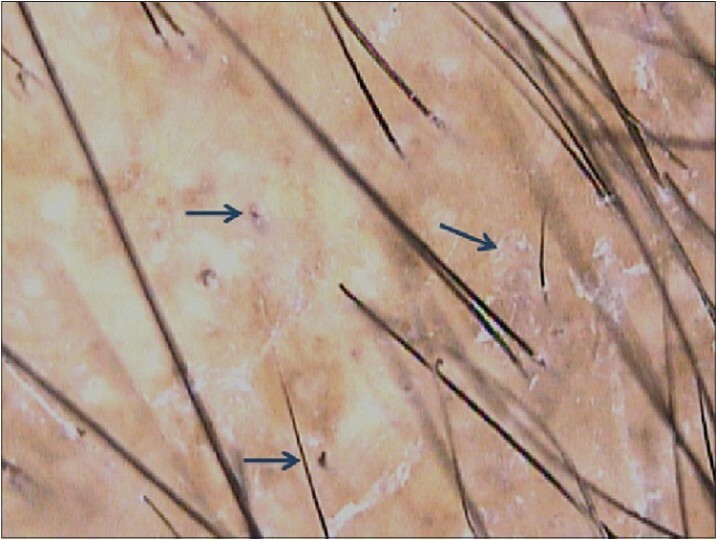 Folliculitis decalvans is characterized by presence of multiple upright hairs (>5) emerging from a single ostium, corresponding to the classic clinical picture. Follicular scaling is seen representing follicular inflammation. In addition follicular pustules are seen at the active border. Twisted capillary loops may be seen in the interfollicular region. These vascular patterns may not be well-appreciated in the darker pigmented skin types even with polarizing light source. The inactive scarred areas are seen as pinkish-white patches with absent follicular openings. 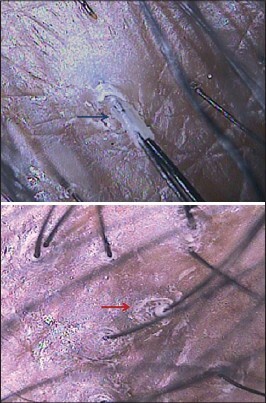 Hair shaft characteristics can be seen easily at higher magnifications through a videodermoscope. 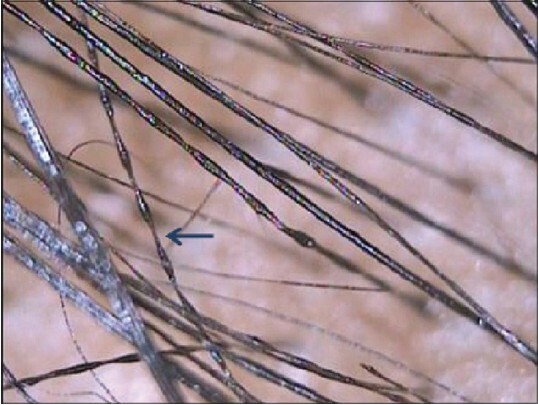 Hair shaft disorders like monilethrix (hair shaft beading) [Figure 10]. ,, Trichorrhexis nodosa (brush like fractures) , [Figure 11], trichorrhexis invaginata (hair shaft nodes), , pilitorti (twisted hair shaft) , can be diagnosed with easy visualization and photographic demonstration of the characteristic anomalies. Being a fully automated device which is software dependent, the trichoscope may at times pose technical difficulties. Though it is a handy bedside instrument, clinicians need to know that the sensitivity is affected by multiple factors; including shampooing habits of the local population as well the racial skin types. Yellow dots may not be visible over freshly cleansed scalp and vascular patterns may not be visualized in darker populations. In addition, it is not very specific as overlap of findings may cause diagnostic dilemma especially in very early stages of a disease thus necessitating a biopsy. Here, it needs to be emphasized that all these factors can be overcome in routine practice with a regular and frequent use of the device. [Table 3] summarizes the trichoscopic characteristics of all the above mentioned conditions. In the absence of a definitive, non-invasive and reliable diagnostic technique for hair and scalp disorders, a trichoscope comes in as a handy and reliable tool especially when faced with diagnostic difficulties or cases where multiple conditions may coexist. The advantage of examining larger areas in a relatively short duration makes it a practical choice for a clinic set up. Moreover, it is relatively easy to acquire the skill and expertise needed for trichoscopy as it can be mastered by all those with a keen eye to observe. Besides, easy record keeping, documentation and comparison with pre-treatment images help to evaluate therapeutic response and satisfy anxious patients. 1. Tosti A. Hair shaft disorders. In: Tosti A, editor. 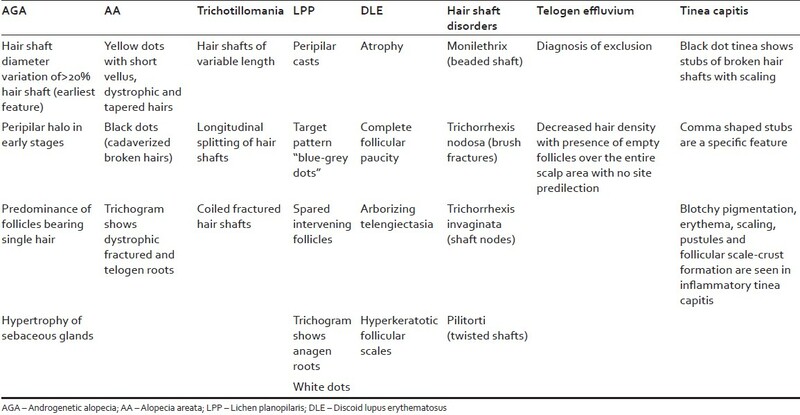 Dermoscopy of Hair and Scalp: Pathological and Clinical Correlation. Illustrated ed. USA: CRC Press; 2007. p. 51-3. 2. Rudnicka L, Olszewska M, Rakowska A, Kowalska-Oledzka E, Slowinska M. Trichoscopy: A new method for diagnosing hair loss. J Drugs Dermatol 2008;7:651-4. 4. Lacarrubba F, Dall'Oglio F, Rita Nasca M, Micali G. Videodermatoscopy enhances diagnostic capability in some forms of hair loss. Am J Clin Dermatol 2004;5:205-8. 5. Ross EK, Vincenzi C, Tosti A. Videodermoscopy in the evaluation of hair and scalp disorders. J Am Acad Dermatol 2006;55:799-806. 6. Duque-Estrada B, Tamler C, Sodré CT, Barcaui CB, Pereira FB. 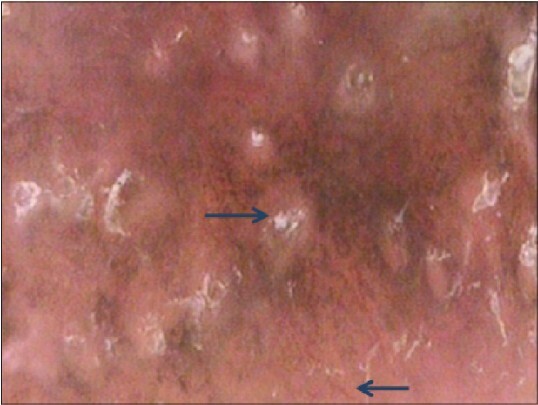 Dermoscopy patterns of cicatricial alopecia resulting from discoid lupus erythematosus and lichen planopilaris. An Bras Dermatol 2010;85:179-83. 7. Rakowska A, Slowinska M, Kowalska-Oledzka E, Rudnicka L. Trichoscopy in genetic hair shaft abnormalities. J Dermatol Case Rep 2008;2:14-20. 8. Rakowska A, Slowinska M, Czuwara J, Olszewska M, Rudnicka L. Dermoscopy as a tool for rapid diagnosis of monilethrix. J Drugs Dermatol 2007;6:222-4. 9. Jain N, Khopkar U. Monilethrix in pattern distribution in siblings: Diagnosis by trichoscopy. Int J Trichology 2010;2:56-9. 10. Kharkar V, Gutte R, Thakkar V, Khopkar U. Trichorrhexis nodosa with nail dystrophy: Diagnosis by dermoscopy. Int J Trichology 2011;3:105-6. 11. Mane M, Nath AK, Thappa DM. Utility of dermoscopy in alopecia areata. Indian J Dermatol 2011;56:407-11. 12. Kharkar V. Overview of trichoscopy. In: Khopkar U, editor. Dermoscopy and Trichoscopy in Diseases of the Brown Skin. 1 st ed. New Delhi: Jaypee; 2012. p. 169-81. 13. Thakkar V, Haldar S. Trichoscopy of patchy alopecia. In: Khopkar U, editor. Dermoscopy and Trichoscopy in Diseases of the Brown Skin. 1 st ed. New Delhi: Jaypee; 2012. p. 182-201. 14. Rudnicka L, Olszewska M, Rakowska A, Slowinska M. Trichoscopy update 2011. J Dermatol Case Rep 2011;5:82-8. 15. de Lacharrière O, Deloche C, Misciali C, Piraccini BM, Vincenzi C, Bastien P, et al. Hair diameter diversity: A clinical sign reflecting the follicle miniaturization. Arch Dermatol 2001;137:641-6. 16. 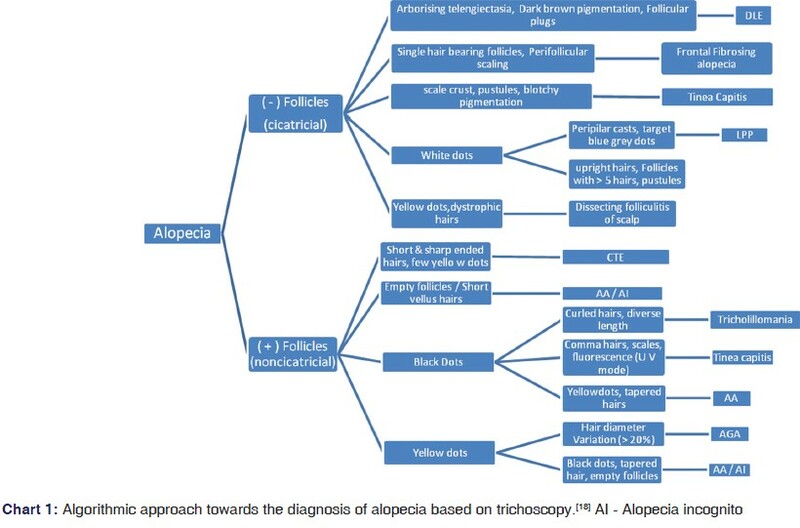 Rakowska A, Slowinska M, Kowalska-Oledzka E, Olszewska M, Rudnicka L. Dermoscopy in female androgenic alopecia: Method standardization and diagnostic criteria. Int J Trichology 2009;1:123-30. 17. Paus R, Olsen EA, Messenger AG. Hair growth disorders. In: Wolff K, Goldsmith LA, Katz SI, Gilchrist BA, Paller AS, Lefell DJ, editors. Fitzpatrick's Dermatology in General Medicine. 7 th ed. USA: McGraw Hill; 2008. p. 753-77. 18. Shuster S. 'Coudability': A new physical sign of alopecia areata. Br J Dermatol 1984;111:629. 19. Slowinska M, Rudnicka L, Schwartz RA, Kowalska-Oledzka E, Rakowska A, Sicinska J, et al. Comma hairs: A dermatoscopic marker for tinea capitis: A rapid diagnostic method. J Am Acad Dermatol 2008;59:S77-9. 20. Rudnicka L, Ozewska M, Rakowska A. Trichotillomania and traction alopecia. In: Rudnicka L, Olszewska M, Rakowska A, editors. 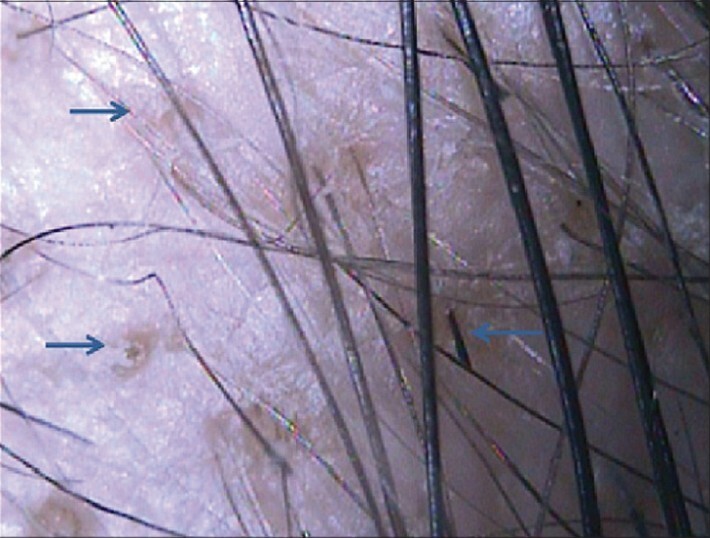 Atlas of Trichoscopy: Dermoscopy in Hair and Scalp Disease. 2 nd ed. London: Springer-Verlag; 2012. p. 257-78.